Published on November 6, 2014 in Caribbean, General T&T, Law and People's Partnership. 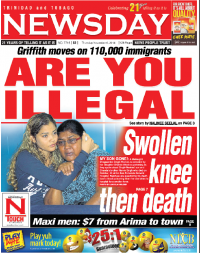 2 Comments Tags: illegal immigrants, Nalinee Seelal, Newsday. IMMIGRATION authorities will begin an exhaustive door-to-door crackdown to weed out illegal immigrants within the next two months, National Security Minister Gary Griffith revealed yesterday adding that the estimated 110,000 illegal immigrants living in this country, will be given a window of opportunity between next month and early January, to have their status regularised. He warned however, those who fail to comply will be found and deported.